This durable Tablecraft 166D 10 oz. plastic shaker is perfect for offering shredded and grated cheeses at your tabletops. With a 10 oz. capacity, this shaker holds just enough product to last through many uses without becoming too difficult to shake. Featuring a crystal-clear body, it's easy for your customers and staff to see the product and identify when refills are necessary. 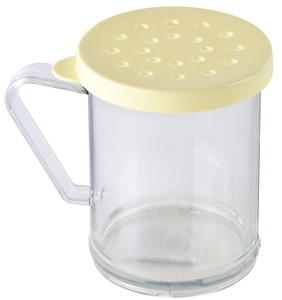 It comes with a snap-tight perforated yellow lid for efficient dispensing.